We finally made it to Myanmar. After months of planning and talking about our girls’ holiday, here we are. What a different holiday this will be – a girls’ own adventure. We left Melbourne at midnight and then had a five hour stopover in Kuala Lumpur – just enough time to check out the airport, check the prices of things, and see what we might like to buy on the way back through – there are some benefits to travelling without hubby! I hadn’t slept the night before we left, and as usual had no trouble sleeping on the plane. Sam laughed as every time I tried to watch a movie; I fell asleep! We arrived in Myanmar around 11am and got picked up from the airport by Sam’s friend Anna and her six-year-old daughter Mia. 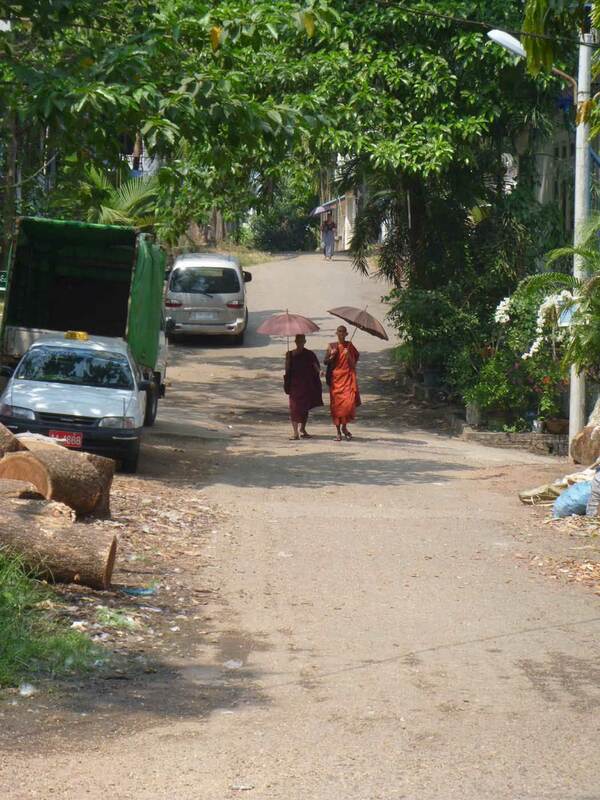 Anna wanted to take us to lunch, so we wasted no time experiencing the chaos of Myanmar. We were hassled a little bit at the airport, but really just by drivers offering us taxis, and really not that many. When we said no, they left us alone. Yangon is a well-developed city which spreads out for a quite a distance. The traffic was unbelievable, incredibly busy and drivers look for any gap – no matter how small – to get through. There may have been only three lanes painted on the roads, but the drivers paid no attention – at times there were five rows of traffic across the three lanes. According to Anna – our unofficial tour guide – they’ve really only had all these cars on the roads for the past couple of years, prior to that it was really difficult to get cars into the country. Now there are cars everywhere, and of course most people have very little driving experience, making matters worse, they really don’t have car insurance – you have an accident you just pay up there and then. Luckily it’s really cheap to take cars to the panel beater! We wandered past a couple of roadside vendors selling food, books, toys and so on, all squashed onto the narrow sidewalk. And just like South Africa, some entrepreneurial types have taken to selling all manner of items from street corners – the most common and interesting of which was a book on foreign investment rules in Myanmar. Of course, being foreigners, we got offered these books every time we stopped at an intersection. Myanmar has a population of about 60 million and the country is not that large, so you can imagine how full the streets are. After lunch, at which every time the waiter came to speak to Anna three others came to watch and listen to her – I think they were impressed with a foreigner speaking Burmese (as were we!). A quick stop at Anna’s to dump our stuff, give Mia her presents and take a quick shower and we were off again. We drove past the Shwedagon Pagoda with promises of returning the following day when it wouldn’t be so hot (did I mention it was 38 degrees?) and drove into downtown Yangon. We parked near the Sule Pagoda, which sits in the middle of the city near the striking town hall building. The Pagoda forms an island in the middle of the traffic – the golden centrepiece of a round-a-bout. The Sule Pagoda is filled with a range of temples each home to a different God looking over their altar. 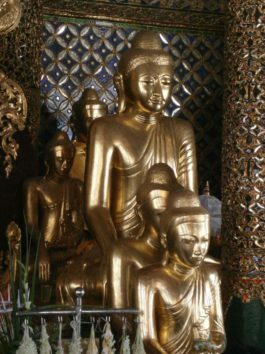 The pagoda itself is a brilliant gold leaf spire with intricate gold spires surrounding it. After the relative calm and quiet of the pagoda, we braved a walk through the streets – cars and people everywhere. But no one hassled us at all. People were interested in us – they looked, but didn’t stare. And whenever Anna spoke Burmese, she had an audience; people were impressed with her skills – and it certainly made it much easier for us to navigate the city. But it did make us wonder how we would manage negotiating the rest of the trip without her! We stopped at a traditional tea house for a cup of tea – I drank tea, they drank coke! The tea was pleasant tasting, but very sweet. Also, while most people had yo yo (normal) tea for them, which is actually Chinese tea for us, they brought me white tea, which I guess was yo yo tea for me. Back out on the streets, we made our way to Sakura Tower. This non-descript building is home to a relaxing oasis on the 20th floor. The restaurant has 360-degree views over Yangon and from our table we had a spectacular view of the Shwedagon Pagoda. We watched as the sun went down and the surrounding lights came on adding extra sparkle and shine to the golden spire. We had an ice cold fruit juice then went for dinner at L’Opera – a beautiful Italian restaurant that sits on a lake. The gardens are lit up with beautiful lanterns and giant umbrellas and the tables all overlook the lake. It really is quite magical. After an early night we were up around 6.30-7 for a leisurely breakfast. After changing our US dollars to a brick of local currency, we headed to the main tourist attraction in town – the Shwedagon Pagoda. You can see the Pagoda from almost everywhere you stop in town – as Anna says, it’s like a ‘where’s Wally’ structure. The golden spire sits high above the town on top of a hill. 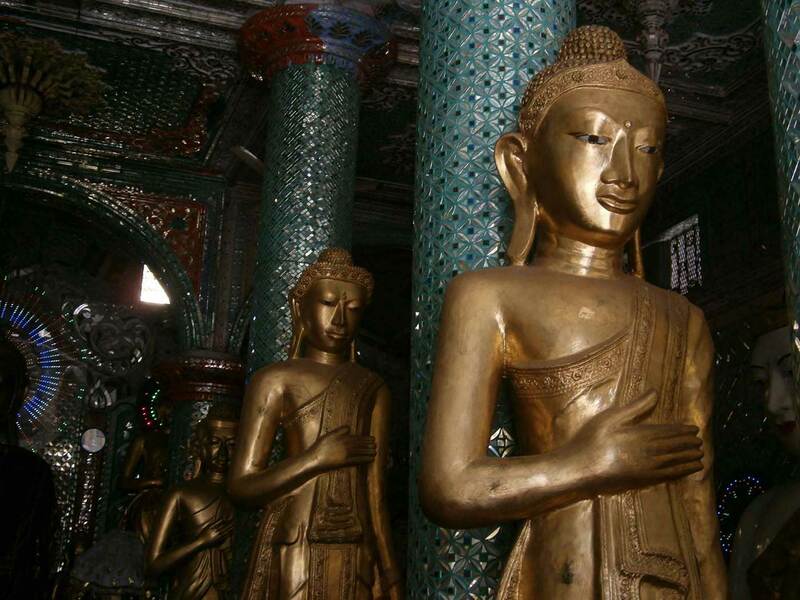 There are a number of pagodas and a range of temples here, enough to keep us busy for hours. We hired a guide to show us around and point out the various temples – and explain their significance. The temple and pagoda are breathtaking and you don’t really need a guide, but without him we would have missed quite a few things. We celebrated the day of the week we were born by throwing water over our respective monuments and checked out the giant ogre – which had received an interesting range of offerings including lit cigarettes. It is remarkable to see the offerings left at each of the temples – hundreds and thousands of cyat (money) left, and yet in a country with extreme poverty, no one touches the cyat. It is left as offerings to the Gods to ensure a comfortable afterlife. Similarly, the sight of golden leaf spires dotted throughout the country, when the people live in bamboo houses that need rebuilding every nine years, is jarring when you are used to a society that values possessions, comfort and austerity in this life. You can enter the Pagoda by any one of four entrances, but there is one that is more impressive than the others so we walked down that one and stopped to buy a couple of trinkets on our way through. We walked through some of the streets around the pagoda to get a better sense of how people live. It is a very poor country, but Anna lives in an area full of Embassy homes – there is a lot of money in this area – so it was interesting to see the contrast in the streets around the Shwedagon! Previous Ah, Fiji – So this is paradise?